There are ways to detox your body without the usage of pills or books. To detox your body naturally you should remember that you are trying to push toxins out of your body or help to speed up your body’s natural detoxing process by giving it more nutrients to help it fight off toxins. If you would like to help rid your body of toxins that build up over time you should incorporate detoxification methods into your daily routine. Some detoxification methods are very simple and do not require much work on your part. Below is a list of ways to naturally detox your body. The more water you drink will impact the cleansing of your body. Water helps clean out your body from extra waste as well as helps to hydrate you. Water is essential to human beings and you should drink at least eight cups of it a day. However, if you are trying to get rid of toxins you may want to drink a little more than eight cups a day. In addition, if you drink water at your body temperature, it is more easily absorbed, so you may want to consider drinking warm water sometimes. The more you sweat the more your body will push out toxins through your sweat. Sweat is significant to toxin removal and whether you sweat through exercising or through visiting a sauna, it does not matter. As long as you sweat, toxins will be removed through your pores when the sweat comes out. Lemons are a great fruit to detox your body naturally. 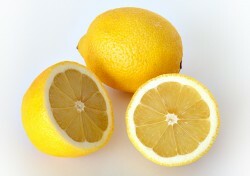 Lemons contain a large amount of citric acid which helps to break down toxins and remove them from your body. Lemons have a sour taste to them so you may want to simply slice up lemons and drink them in your water. Drinking lemons in water is an easy way to help remove toxins from your body and you will be drinking water and consuming lemons at the same time, which is two ways of ridding toxins from your body. Aside from the sweating aspect of exercise that helps you to detox your body, exercise also causes you heart rate to increase, which causes your blood to pump harder, which will result in toxins being pushed out of your body. Cardio exercise is a great way to feel good in addition to removing built up toxins in your body. Fiber helps the digestive system function properly and helps you get more toxins out of your body. If you incorporate more fruits and vegetables in your daily diet you will get more fiber, which is a great way for you to detox your body naturally. You can do this by simply making a fruit and vegetable smoothie every morning. Fruits and vegetables that are high in fiber are: spinach, artichokes, broccoli, carrots, apples, pears, raspberries, and avocados. Your body is important to take care of and not just because you want to live longer, but because providing your body with proper nutrients and detoxing your body will help you feel more energized so you can conquer your daily activities and goals.